Are the protests outside Boyle Heights' newest coffee shop, Weird Wave, an attack on an innocent small business or a righteous fight against gentrification? In Los Angeles, a city already shouldering an ignoble history of ethnic displacement, the current pinches of gentrification have been primarily felt by people of colour in the lower-income communities surrounding downtown, where residents have watched helplessly as the landscape of their birthplaces have changed, seemingly overnight. Though not the first business to be hit with anti-gentrification resistance, Weird Wave Coffee Brewers has had a grueling first few days since opening for business in Boyle Heights last week. Founded by friends John Schwartz, Jackson Defa, and Mario F. Chavarria, the business has been picketed by a patchwork of community groups since its opening, with protestors shouting "SHAME" through megaphones at people who cross their picket line. Boyle Heights, a neighbourhood with a majority Latinx population, has held out longer than others against urban revitalization efforts, watching as adjacent neighbourhoods have been flipped, one by one. Locals have used this extra time to devise a formidable defense against the inevitable waves of change to hit their streets. Steven Rodriguez was outside Weird Wave this past Saturday, protesting as part of the Boyle Heights Alliance Against Artwashing and Displacement (BHAAAD), a group that sees galleries as the opening salvo in gentrification efforts. BHAAAD was part of a successful movement that shuttered PSSST, a year-old Boyle Heights gallery, in February. As Rodriguez listed off his grievances with Weird Wave, it became clear that the protest was being spurned on by the perceived lack of respect being shown to the community by Weird Wave. Rodriguez pointed to posts on the Weird Wave Instagram account that described protestors as "yokels" or blithely dismissed the pickets as a "party" as proof that the owners are not taking "an issue that's devastating the community" seriously. And the divide only grew, according to Rodriguez, when the LAPD was called on protestors on Friday. "Calling the cops on the community you're saying you want to serve," posits Rodriguez. "How does that show you actually want to work with them?" 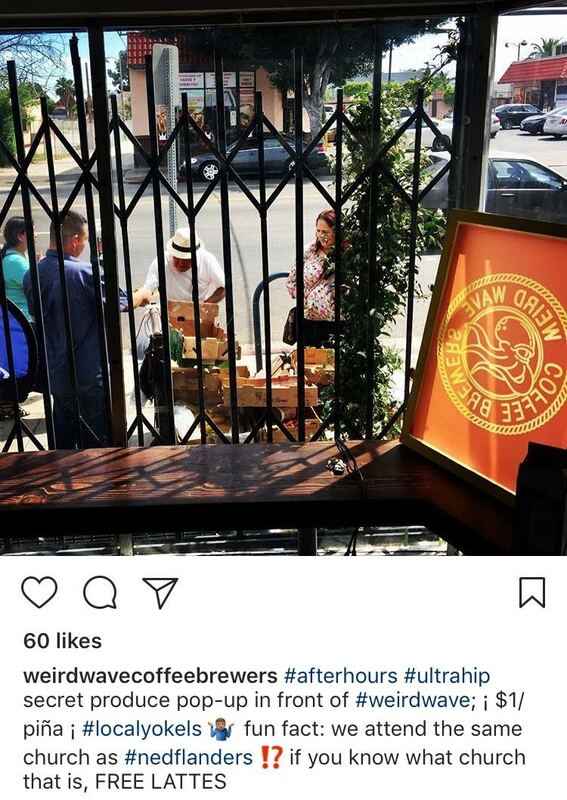 Weird Wave co-owner Mario Chavarria told me that the three proprietors are "a bit social media awkward," which may have contributed to their posts being construed as antagonistic, but he never imagined "the hate [directed at Weird Wave] on Instagram would come out and turn into this." A number of protestors alleged to me that Chavarria is a token Latino folded into the business plans by the two other white owners as a way to curry acceptance from the predominantly Latinx community. He dismissed these claims, noting that the three have been longtime friends and neighbours, and that he, himself, was funding the project. "I think [the protestors] hesitate to talk to me because there's no case there," says Chavarria. "The anger is clearly directed toward John and Jackson." Jackson Defa and Mario Chavarria watch the protest outside. "They've been very opposed to dialogue, confronting facts, or inquiring about who we are as people," said barista and co-owner Jackson Defa. "I've tried to start one with them a few times, and they've returned that with rhetoric and hatred. After that, I find there's not much more you can do. If somebody's not willing to sit down and talk, where can you go from there?" Defa said that, despite a lifetime of living and working in "the center of the ghetto" in cities around the West Coast, oftentimes as "the only white person," this is the first instance where he's felt unwelcomed. "I've never experienced a group of people who refuse to get to know me, and instead, project an image onto me that's not who I am," he said. A woman representing Defend Boyle Heights, one of the larger anti-gentrification coalition groups at the protest, refused to give her name or be interviewed because, as she put it, "VICE is a fascist organization," but was candid when I asked the group's demands of Weird Wave. "I think it's pretty obvious," she said. "There's only one demand: leave." Despite the vocal protests and screaming matches breaking out in front of Weird Wave, it bears mentioning that there is not a consensus opinion within the Boyle Heights community regarding this new business. A number of commenters claiming to be Boyle Heights locals welcomed Weird Wave to the neighbourhood on the shop's Instagram posts. Inside Weird Wave, I overheard a patron complain to another that "I've lived in this neighbourhood my entire life. They're gonna tell me I can't get coffee here?" Steven Almazan, a Boyle Heights native who was present at the protest, has been conducting research and analysis on displacement, affordable housing, and potential equity building opportunities for low-income families in marginalized communities for his masters in Public Policy from UC Berkeley. Almanzan considers himself and other upwardly mobile, college-educated Latinxs from the community "gentefiers," and sees the strife around Weird Wave as indicative of a much larger issue facing Boyle Heights and other lower-income communities nationwide. "How do we ensure that we desegregate cities while providing more opportunities for mixed-income neighbourhoods," asked Almanzan. "Studies show that if low-income families live in mixed-income neighbourhoods, their kids are more likely to succeed. Boyle Heights is very unique in that they're one of the few neighbourhoods in LA and in California on the low-income end that's showing resistance through community meetings and protests like the one here at Weird Wave. Through that process, it's confusing developers and it's confusing incoming businesses because they don't see this type of resistance elsewhere." Almanzan said he believes the missteps in communication between Weird Wave and the community will likely eventually result in the business shutting down, but he doesn't think that businesses of that ilk should necessarily be off the table going forward. "I feel I can have it both ways. I can have really nice coffee while also eating pan dulce at my local panadería." Follow Justin Caffier on Twitter.